By using the product option feature, you can create product bundles. 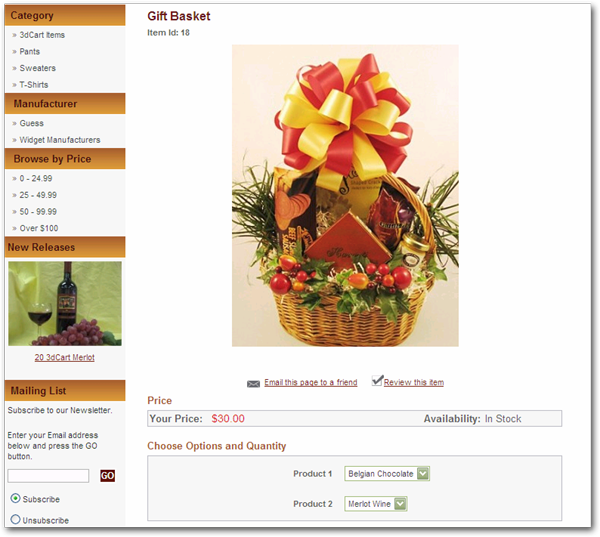 Product bundles allow you to link multiple products from your database together to create a bundle/kit. The product bundle feature will remove stock from the products that are included in the kit as well as list out each individual sku on your invoices. It is important to note, you should not include products with options into the bundle as the customer will not have a choice to choose which option they want – i.e. size, color, etc. Furthermore, even though the bundle will deduct inventory, it will not check to make sure the products included in the bundle are in stock. Locate the Item you want to add the bundle options to and click on its Thumnbail Image, ID, or Name to open it up. You can also look to the far right of the product and click on its Action Wheel and select "Edit" to open up the product. While viewing the product editing page, you will see a series of tabs located along the top of the page. Look along the top right of the page and click on the +Add New" button to add an option to the product. Type in the Sorting number which is used to control how your options display if you have more than one for the same product. Lower numbers will display before higher numbers. The option type must either be Dropdown or Radio for this feature to work. By following the steps above, you have created an option designation on the product. Now, you will create the individual option selection sets for the product. Look towards the far right of the option listing you just created, and click on the "+Add [option-name]" link. The link to add your option sets will be labeled with the name of the option. For example, if the created option name is "Colors" then the link to add individual option selections will be labeled "+Add Color"
Change the option's sorting, part number and additional value if needed. This will create the selectable option on the product. After you've created your selectable option, you will proceed with the next steps to create your bundled items. Look to the far right of the option set and click the "Select" link in the Custom Item section. A pop up window will appear listing your store's products. Locate the product you would like to add to the bundle, and click on its action wheel to "Select" the item for bundling. The bundle feature will not add up the prices of each individual product you add to the kit. If a shopper selects the bundled product, the price of the bundle will reflect the price entered on the Product's Information tab. If you'd like to also include the weight of the items in the bundled kit so that shipping calculation takes the total weight of the package (Item and bundled items) into consideration; please proceed with the following steps. Scroll down to the Checkout section until you see the "Bundles - Add subitems weight " checkbox. It is located just below the "Edit Invoice Number" link. This setting will combine the total weight of the main item as well as its sub-items* when the bundled kit is purchased. (*This does not work with sub-item weights specified using Advanced Options.